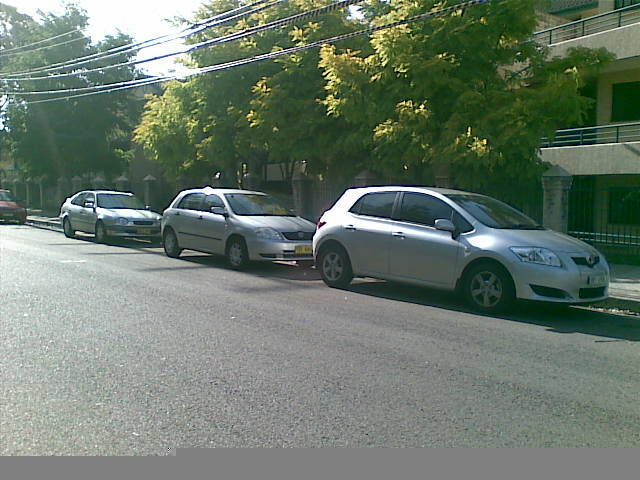 The cars belong to – from left to right – Jenny, me and somebody else that frequently parks here on weekdays. What is it with consecutively parked Silver Toyota cars? I had a bit of a Toyota Kodak moment today in Strathfield. As you can see in the above photo, parked on either side of my car was pretty much the rest of the Toyota range of passenger vehicles – all silver, no less. Might as well have been a Toyota dealer! From left: Camry, (my) Corolla, Echo sedan and Rav 4.